Summer and the hot weather is still here to enjoy. Time to get active and embark on some DIY projects before the weather turns. During the warm weather months, your home deck can be a restorative retreat, a place to barbecue and share conversation and drinks, or the perfect spot to unroll your yoga mat. But Michigan weather takes its toll on your deck’s wood and finish. It is important to maintain your deck’s visual appeal and durability. If you need to do repairs, John’s Lumber will help you choose the wood and materials necessary to get the job done properly. Do you need a new deck? John’s Lumber is the largest decking dealer in Macomb County with an incredible selection and experience to guide you. For the seal and finish you desire, we will be there to advise high quality products that are reasonably priced as well. Let’s take a look at some basics to consider in the project. 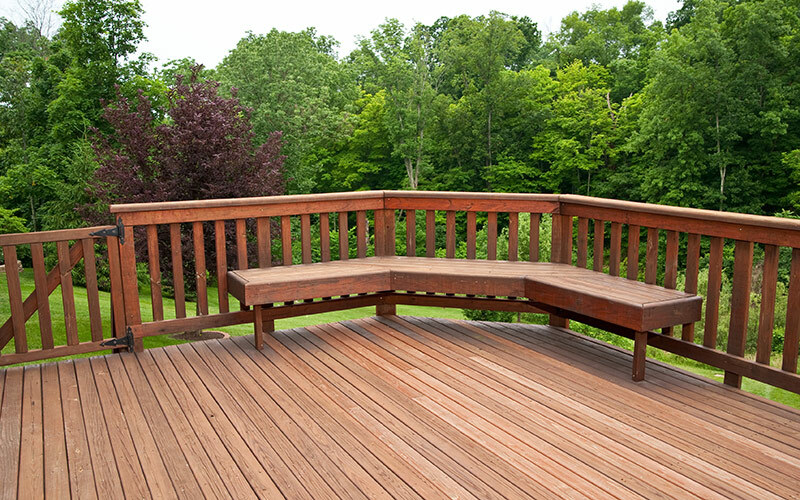 For staining, it is important to begin by cleaning and smoothing your deck surface. The wood must be clean and dry to ensure that the sealant or stain adheres to the wood properly. We can assist you in identifying and eliminating any mildew or mold as well, so that you are not sealing something that can cause your wood to decay. You need to give your deck at least a day or two to dry out, so check the weather and make sure rain isn’t in the forecast. When you are ready to apply the sealant or stain, our experts are here to guide you because not all are created equally. It is important to follow the directions on the particular sealant that is purchased and assess your application tools. Do you need a roller, a stain pad, a brush, or a sprayer? Some combination of these? Depending on your surroundings and structure of the deck and its wood, our team will lead you to the appropriate choice for the best outcome. Choosing the right tool also helps avoid the common mistake of applying too much product. To avoid undesired streaking, work on one panel at a time and move systematically through the project. Stop by and visit us in Shelby Township or Clinton Township to learn how to get started. Visit our website to learn more.